[By Nick, New for 2015] It's been awhile since I've been excited by an ice cream sandwich. 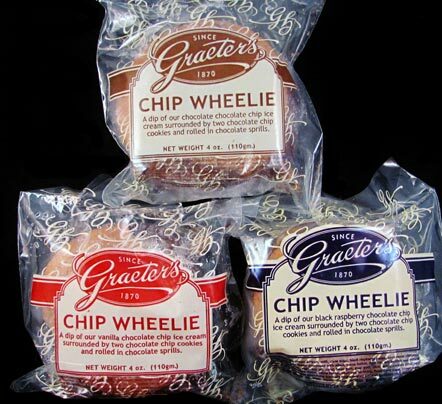 ‎When I got news of Graeter's new Chip Wheelies, I was quite curious. Thankfully the nice folks at Graeter's sent over a couple of free samples of each sandwich to me. It's actually hard to tell each sandwich apart before cutting into them due to the sprinkles. Let's start out with the Vanilla Chocolate Chip Wheelie! Biting into it, the chocolate chip cookies are fresh and soft. No rock hard, stale, crumbly cookie here. That's a major plus because the cookies are what separates this from their normal pints since these are their standard flavors and all. The vanilla chocolate chip ice cream goes well with the cookies. The chocolate sprinkles don't really add much besides making it a little more messy and add a little crunch to the mix. This is a simple sandwich but it works perfectly. It's a pure representation of the classic cookie ice cream sandwich. I highly approve of this one. Let's move on to the Chocolate Chocolate Chip Wheelie. Since I already covered the cookie and sprinkles component in the previous sandwich, let's just talk about how the ice cream work with it. This one doesn't quite fare as well as the vanilla. That's because the chocolate is far too strong. It overpowers the cookies too much and doesn't let their flavor shine at all. If they used chocolate cookies, I think this would really appeal to the chocolate lovers. As is, I'd stick with just buying a pint of their chocolate chocolate chip ice cream. Last up is the more unique Black Raspberry Chocolate Chip Wheelie. Honestly, I'm a little hesitant about this one. 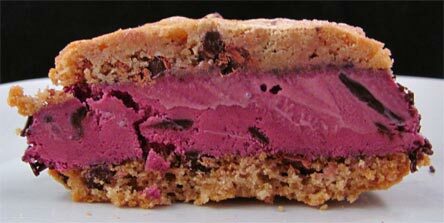 Black raspberry chocolate chip ice cream and chocolate chip cookies don't sound like they would work on paper. And that's exactly the case here. The two are great on their own but they just seem forced when put together. They don't compliment each other at all. It's one of those cases where the combination just ends up making the two worse than if they were on their own. This one I'm not too much of a fan of at all. Dubba's Note: maybe they should have used chocolate chocolate chip cookies like I did long ago >>> hey, the new peppermint wheelies have choc choc chip cookies, they could use those! As it stands, it looks like I reviewed them from best to worse. If you want to try a sandwich, I say go with the classic vanilla. You can't go wrong there, well, except that it's $6 a sandwich, and that's asking a lot. 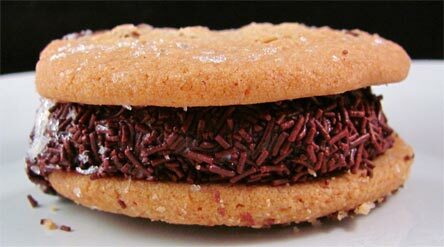 These are distinctly smaller than a Coolhaus sandwich and those are far superior. I can't say I would NOT recommend the chocolate but it wouldn't be my first choice for a chocolate novelty by a long shot. The black raspberry I can't recommend in the least bit. If you've tried these, please let me know your thoughts in the comments! Wow, I was excited to see this at first then massively disappointed. The Peppermint Stick ice cream might be my favorite ice cream flavor period, seasonal or not. The Chippie therefore looked cool to me, until I see your comment that a) they're smaller than a Coolhaus (which aren't that big either imo), then b) they're 6$ each !!!!! !